7:1 These promises I just mentioned are for us, dear friends. So let’s keep our lives pure. Let’s stay away from anything that would leave us feeling dirty, in body or spirit. And let’s focus on our goal of completely devoting1 ourselves to God, out of the reverence we have for him. 7:2 Find room in your hearts for us. We haven’t done anything wrong to anyone. We didn’t point anyone in the wrong direction. We didn’t take advantage of anyone. 7:3 I’m not saying this to load you up with blame. I’ve already said you have a home in my heart. We live together. We die together. 7:4 Listen, I have great confidence in you folks. You make me incredibly proud. In spite of all the trouble I’m going through right now, I want you to know this. I’m filled with encouragement and joy. 7:5 When we got to Macedonia, we quickly discovered we’d get no rest there. Critics targeted us from all sides. We had to fight the critics around us and the fear inside of us. 7:6 But leave it to God. He’s the one who encourages the discouraged. That’s what he did for us when Titus arrived. 7:7 It wasn’t just his arrival that encouraged us. It was the message he brought. He said you had encouraged him. He told us how much you cared for us, how sorry you were, and how you are worried about me. When I heard that, I was happier than ever. 7:8 I know you were upset by the earlier letter2 I sent. I’ve got to tell you, I’m not sorry I sent it. I’m sorry the letter upset you, but I’m glad it didn’t last long. 7:9 I’m celebrating now. It’s not because I made you sad. I’m celebrating because your sadness prodded you to repent and change your behavior. God was at work in all of this. That’s why you weren’t hurt by what we wrote. 7:10 The kind of sadness God wants people to experience is sadness that comes from sin. This sadness convinces people to repent and to change their way of life. It drives people toward salvation. There’s no reason to regret this kind of sadness. But let me tell you this. Sadness that doesn’t convince people to give up their sinful way of living is a sadness that ends in death. 7:11 Look at what this sadness did for you—sadness God wanted you to experience. What an incredible desire it gave you to want to clear your name. What anger you felt, what fear, what desire, what energy, what willingness to accept punishment. I want you to know that in every way possible, you have proved yourselves. You have restored your innocence. 7:12 I didn’t write that earlier letter3 because of the person who did wrong, or because of the person who was hurt. I wrote it because, with God as a witness, I wanted you to see for yourselves how much you care for us. 7:13 I’ve been encouraged by all of this. More than that, I’m happier than ever because Titus is so happy. You gave his spirit a big boost. 7:14 I had bragged about you to Titus. I’d like you to know that you proved me true. You didn’t embarrass me. 7:15 Titus loves you more than ever when he remembers how you welcomed him, obeyed him, and treated him with reverence and respect. 7:16 I’m celebrating here. I’m so happy because I now know I can trust you completely. 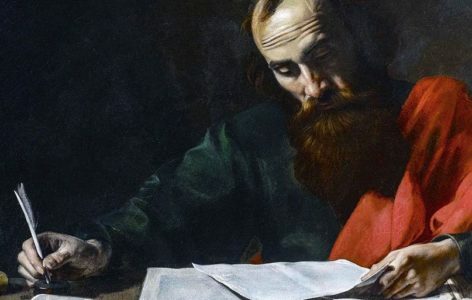 This earlier letter that Paul talks about is known among Bible experts as the “Severe Letter” or the “Letter of Tears.” Some scholars say this painful letter, which Paul also refers to in 2 Corinthians 2:3-4, is lost. Others say the letter is at least partly preserved in the hard-hitting chapters of 2 Corinthians 10—13. In the opening line in this chapter, Paul says, “These promises I just mentioned are for us, dear friends” (7:1). He doesn’t identify what promises he’s talking about. What would you guess he’s referring to? The Casual English Bible generally translates the word “holiness” as devotion to God. So it has Paul saying “Let’s focus on our goal of completely devoting ourselves to God” (7:1). Do you think that’s good enough? Does that pretty well cover what is more literally translated as “perfecting holiness”? Paul says, “The kind of sadness God wants people to experience is sadness that comes from sin. This sadness convinces people to repent and to change their way of life” (7:10). What kind of sadness do you think Paul is talking about? What does it look like? LIFE APPLICATION. Paul tells the people in Corinth, “So let’s keep our lives pure. Let’s stay away from anything that would leave us feeling dirty, in body or spirit” (7:1). In their case, he was probably talking about the temptation to go back to their religion of worshiping idols. Or perhaps the temptation to follow some of the preachers who were spreading a twisted version of Christianity. But what would it mean in our culture today? What do you think Paul would be telling us to stay away from? LIFE APPLICATION. Paul had written a stern letter to Christians in Corinth. It was apparently a hard-hitting disciplinary letter. The people had apparently made some stinky choices, and Paul told them so. After sending the letter, Paul got worried about how the Corinthians would respond: “I know you’re upset by the earlier letter I sent” (7:8). Fortunately, they responded well. They admitted their failure and moved on. How do we tend to deal with people we care about who make stinky choices? And what techniques seem to work best? LIFE APPLICATION. Clearly, Paul is ecstatic about the news that his letter restored his relationship with the Christians in Corinth: “I’m happier than ever” (7:13). When have you seen people feel like that when a relationship was saved from the brink, or perhaps raised from the dead?